On-the-go toys for on-the-go families! With this wobbly, bobbly bunny friend, you can keep your little one entertained almost anywhere you go. 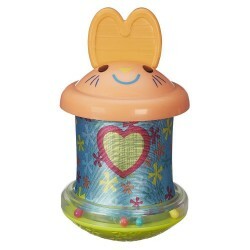 Best of all, this adorable toy for babies is designed to be easily collapsible and totally portable! The weight at the bunny's bottom will make it sway without toppling over when baby bats at him, and the bright colors and rattling beads can keep baby busy and stimulated. When it's time for your next adventure, collapse the bunny down to pocket size and take it along in your diaper bag or purse!